However, as any violin instructor or professional will tell you, an important part of playability and sound of your violin is established by the type of strings used on the instrument. The strings are the voice of your violin, and different types and styles create subtle differences that are particularly adapted to specific types of music. Moreover, certain strings are easier to play. Recently, Thomastik-Infeld, an undisputed leader in string innovations for almost a century, released their new Alphayue violin strings. Manufacturing hand-crafted strings in Vienna since 1919, their latest synthetic contribution provides violin students with a responsive string that delivers warm clarity and long-lasting durability. Highly resistant to climate and temperature change, Alphayue violin strings are particularly suited for beginning to intermediary students. The tone produced on Alphayue strings is clear and bright, although not as bright as a traditional steel set of student strings. And for a string at this price point, the tone is warm and colorful, and the clarity is excellent. The composition of the strings provides long-lasting staying power so that as a student, you won’t have to spend an excessive amount of your practice time re-tuning your violin. Student violinists are often saddled with poor projection. And although the problem often stems from improper bow holds or an instrument that needs adjustments, the strings affect the amount of projection too. This Alphayue set won’t help your violin sound soar over an entire orchestra, but the ease of playability and clear tones generate good projection and help students develop the bowing skills that will benefit their playing in the future. Another great feature of Alphayue strings by Thomastik-Infeld is the price. Synthetic strings of this caliber traditionally range from are typically more expensive. However, you can purchase the Alphayue set for around $20, which makes them an incredibly affordable way to improve the sound and playability of your violin (or of your students' orchestra!). With the ability to maintain their tone and deliver it with warmth and clarity, this set is perfect for student musicians. Finding the right set of strings for your student violin can take time, but Thomastik-Infeld has made it easier by combining the solutions that student players need into their new Alphayue set. With an affordable price-tag, long-lasting durability, and the quality of synthetic, these strings are an excellent choice for student violins. 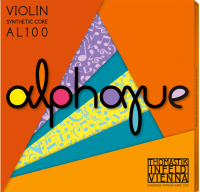 You can find out more about this and other violin string sets at the Thomastik-Infeld website, and you can check out Alphayue strings in action by viewing videos and reviews online that demonstrate the range and capabilities of this fantastic new product.